I went to Leonie’s today and we made 4 lovely cards. I will share them with you over the next few days. This card was so much fun to make. Lots of measuring and Leonie came up with some unique measuring units – “dingy” thing 🙂 Just as well we understood what she was referring to. The centre of this card slides up and reveals a message beneath. Isn’t that clever? A great card to make for someone special. I received this award from my friend Wendy P. Wendy gets around a lot. Wendy was born in New Zealand, then moved to Queensland, back to New Zealand where she thought she was settled. Then there was a move to Victoria (so her DH could get work) and now they’ve moved to Tennant Creek in the Northern Territory. Most people know my favourite colour is blue, however after 31 years of marriage DH thought it was purple!! When I was younger I was a Brownie and then a Girl Guide. My middle name is Jane. I don’t like suspension bridges – you know those ones that wave about when you’re on them? Pop along and visit their blogs. My lovely friend Leonie was waiting for me after her long trip from Campbelltown to Kellyville – she’s a gem and also my upline. Leonie prepared 2 lovely make and takes as well as walking us through the catalogue and talking to us about the new Summer Mini Catalogue which goes live on 1st December here in Australia. This is Karen and Lesley. Karen’s waiting while Lesley was in deep concentration. Just in front of Karen you may be able to see the card we made. Here are the 2 Margarets. Some of the tape adhesive proved more challenging than making the project. The above photo shows you the little boxes I made and filled with chocolate as a thank you for attending. The ladies also received the template for the box so they could make more if they need too. Hint When making such items use the red sticky strip tape as it’s strong and helps keep these lovely little projects together. I love this set of stamps as you can use it for so many different occasions or celebrations. I like the effect of using the lighter blue ink as a background with the darker blue looking like foreground. The ribbon I found in one of those cheap everything type stores and it’s actually light blue on half and dark blue on the other side. Down the centre of the ribbon is a large sort of running stitch. It’s too wide for this type of card so I used some double sided tape and folded it in half and adhered it to the card with the dark blue on the bottom. I think it has a lovely effect and of course when I tied the bow I made sure the darker blue was facing out so it could be seen. It was an easy to make card and a bit of fun too. This is a card I made with Leonie at our Stamp-A-Stack. I just love this embossing folder by Stampin’ Up®. Clean and simple but very elegant. 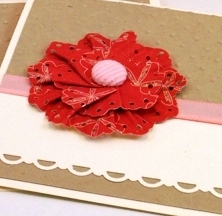 This card also used the polka dot Rich Razzleberry ribbon which is being retired this month. 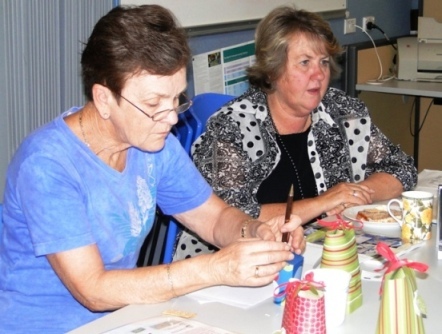 Check out Leonie’s blog for more inspiration and to purchase any supplies you may want or need. Leonie can be contacted here . 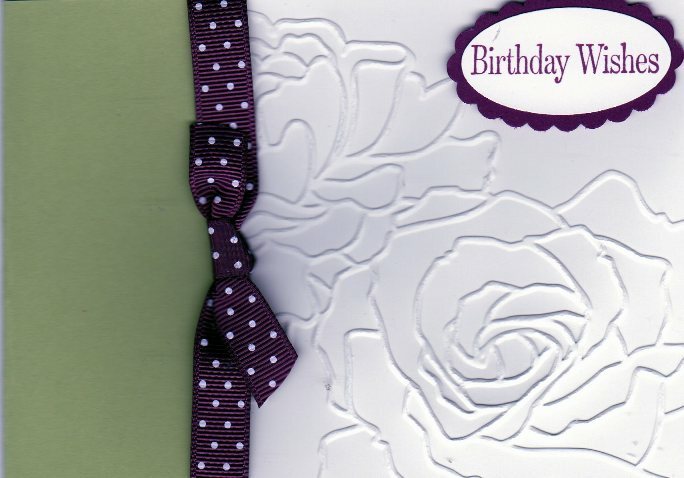 Accessories: Big Shot, Manhatten Flower Textured Impressions Embossing Folder, Large Oval Punch, Scalloped Oval Punch, Rich Razzleberry Polka Dot ribbon. This card is so very easy to do and can be used to suit any occasion by simply changing the sentiment. The sentiment comes from the new Occasional Quotes stamp set which is a new Level 3 Hostess set in the 2010-2011 Idea Book & Catalogue which you can access through my Stampin’ Up! website. · Brad or Button for centre. · Cut circle from base cardstock and cover with strong adhesive – about 1 ¼” diameter. · Attach one end to the outside of the circle. 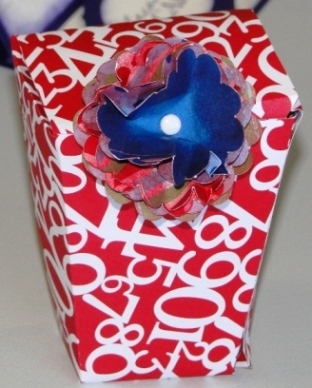 · Folding as you go, work around and around the circle with the piece of crimped patterned paper. 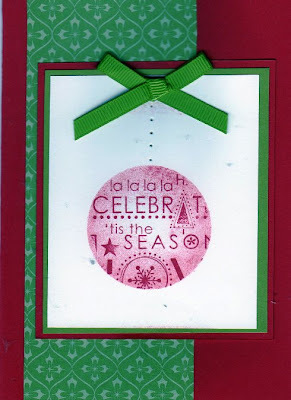 I went to my friend Leonie Schroder’s for a Stamp-A-Stack, using Stampin’ Up® products. 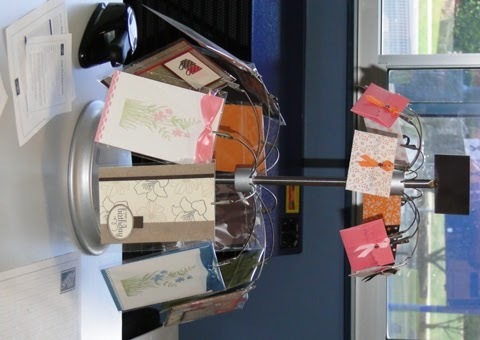 I love doing these classes as you always come away with 9 beautiful cards – a great afternoon’s work. We used the lovely Medallion Stamp with these 3 cards as well as the Top Note Die. Leonie showed us a neat trick with the Top Note Die – run 3 sheets of card through the Big Shot and then to get the Top Note Die so it’s a little smaller than the original, just cut along the perforated line that the die leaves when cut. We made 3 of these cards using different colours. You could use them for any occasion. I chose the Birthday Wishes sentiment stamp. I love the Medallion stamp. We stamped it on the white card with Versamark and then embossed with white embossing powder. After that we sponges over the image with ink. The Butterfly stamp is gorgeous and we stamped that using Stazon black ink. We used Aqua painters to apply the ink and then cut around the butterfly and adhered it to the card using dimensionals. 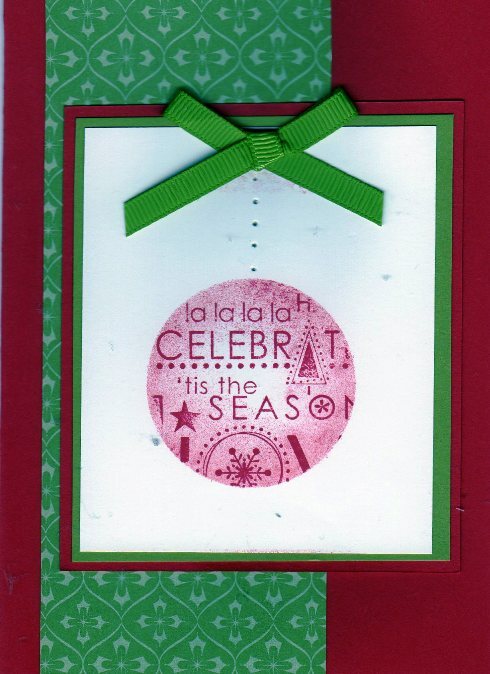 The sentiment is coloured with the Stampin’ Up® water based markers in two colours. It’s important to remember to hugh on the stamp to ensure it’s wet enough to stamp on the card. 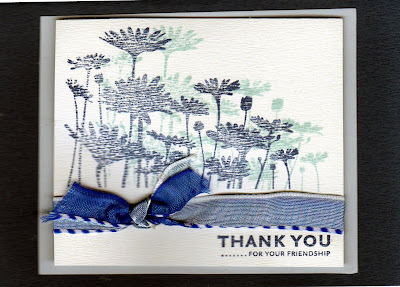 This is such an elegant card and again could be used for many occasions. Yes, I know – you don’t want to think about it yet… It will be here sooner than you think. I did a Stamp-A-Stack class with the lovely Leonie Schroder. This is one of the cards we made. All the products are Stampin’ Up®. I love the bauble. We used the masking technique for that. We punched a hole in a post-it-note and centred it on the white card. We then stamped the sentiment and sponged around the edge of the circle. When you lift the post-it-note off, you are left with s mall bit of white in the centre which gives the bauble a 3D effect. Welcome to my new Blog. I am so excited to announce that I have joined the world wide family of Stampin’ Up!® I am really looking forward to my business launch on Sunday 7 November, 2010. If you would like to join me for this demonstration and walk through the 2010 – 2011 Idea Book and Catalogue, please contact me today. It is my intention to share with you many of the items I create using the wonderful products of Stampin’ Up!® I already have a couple of projects to share, so call back again to see what I have created to share with you. Please feel free to leave comments – I just love comments. If you go to the trouble of visiting my blog, you may as well leave me a little comment.